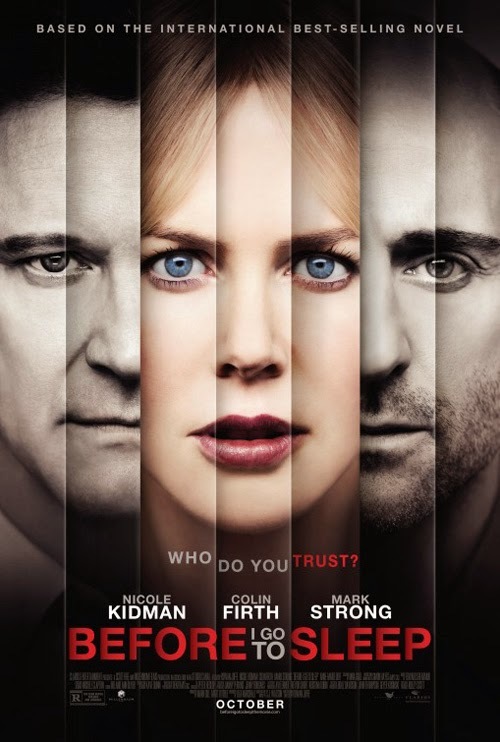 (SPOILERS) An interesting cast (and Nicole Kidman) can’t do much with Rowan Joffé’s adaptation of SJ Watson’s 2011 bestseller. Before I Go to Sleep is a thriller about a woman with anterograde amnesia, who can only store up the memories of one day before she resets herself. This a movie daft enough that it makes the condition seem like a ludicrous invention, one suggesting unexplored options that might undermine the whole conceit (what happens if she decides to pull an all-nighter? ), but not daft enough to really go for broke and have fun with its inherent ridiculousness. Joffé, son of Roland (remember him? He’s been regularly making movies no one has bothered seeing since the end of the ‘80s), received decent notices for the unnecessary recent re-adaptation of Brighton Rock, so why he felt the need to squander that goodwill with this tripe is anyone’s guess. Perhaps the paucity of the material does serve to highlight his slick and well-honed technique, even as it also emphasises that he can’t work wonders as a screenwriter. Or maybe it’s a case of what works on the page is exposed in all its holey glory on the screen. Ridley Scott, ever with an indiscriminate appetite for the tripe, produced. Hubby Ben (Colin Firth) informs Kidman’s Christine of her condition when she awakes one morning. This is something he does every morning before going off to work. She soon (as in, soon after getting up) discovers she has been seeing a doctor, Dr Nasch (Mark Strong). He advises her to keep her attempts to regain her faculties from her husband, who might not understand. To this end, Christine is given a video camera to log her thoughts each day. She will play it back to herself the next morning, so creating a self-taught guideline to follow. Inevitably, suspicions arise of just what Ben is up to, and why he’s keeping things from her. And, just as inevitably, suspicions of Nasch’s motives also accumulate. For 40 minutes or so, this is passable enough, a mixture of Memento and Suspicion, continually shifting the sands of what may or may not be the reality of the situation. It’s absurd from the off, but the hermetic nature of the plot allows for some resistance to overt interrogation. Alas, when the actual reveal comes it’s of the most banal kind, and driven by conventions rather than anything really plausible to the characters. Nor does it bear no scrutiny in terms of the basic logic of the situation. To pull off this kind of charade, you need to flaunt the absurdity (like De Palma would). Joffé’s cast are too reliable; Firth’s almost makes you buy Ben, Strong gets to play a normal (-ish) guy for a change, and Kidman is as unappealing as ever but better deployed than in Paddington. Ben is revealed as your decidedly non-classic post-Patrick Bergin psycho at the drop of a hat (or play of a video), and the hows of this impostor status invite ridicule. How did Mike (the real name of Firth’s character) get by posing as a teacher under a faked identity? Why would real Ben, even given his estrangement, have no contact whatsoever in four years, even to check up on her? Why didn’t Nasch find out her son was alive? For a doctor so obsessed with a patient, he’s remarkably clueless. It’s also no wonder Mike eventually completely loses it, taking her back to the scene of the crime and having a meltdown, after four years of incessant whinging from Nicole. As for real Ben and son showing up at the end, it’s good to know they finally care when prodded to do so. Now, if they’d got John Lithgow to play Ben/Mike (and the real Ben, and Christine too) that would have been more like it.